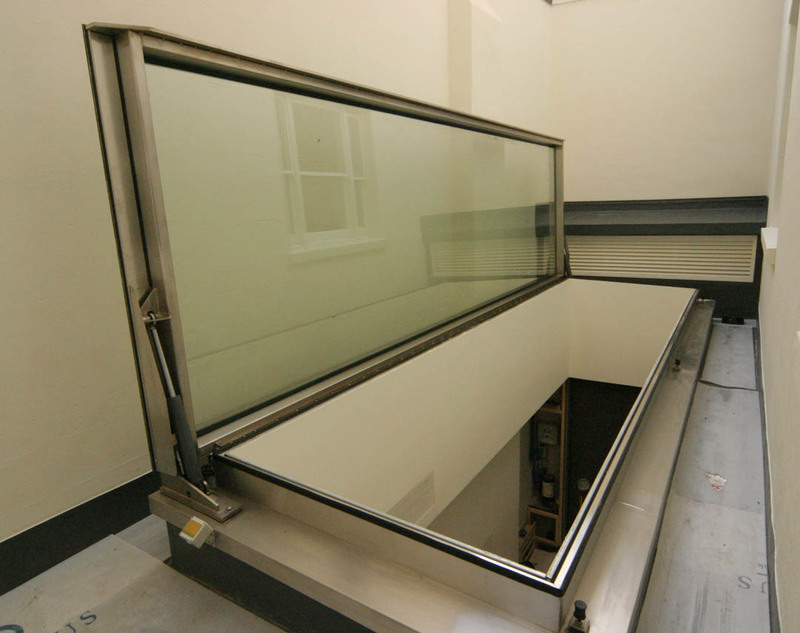 This hinged opening roof is fitted at the base of a deep lightwell. It pivots up to fully open the hole for maximum light and ventilation. It is fitted with a single pane, so that even after it opens, the framing is just as out of sight as when closed. All that can be seen from directly beneath the hole is sky, whether open or shut. The 850kg system is driven by powerful hydraulic rams tucked in very close to the hinges to maintain the clearest possible unobstructed views. These rams exert enormous force to open such a large roof discreetly, so our static chassis provides all the restraint necessary to withhold the forces and not put undue stress on the building itself. The roof may be partially opened to allow air venting. The roof is so large this allows enormous amounts of natural air circulation. The rain sensor can be over-ridden to allow this even with rain falling. With the roof fully open, the area feels very much like a courtyard. The opening is completed within 35 seconds. Lowering the glass unit down behind the building with a crane reaching over 7 storeys was a very delicate affair.